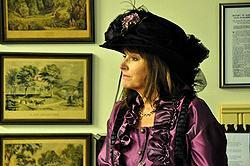 Peggy Gross, current owner of the mansion, in appropriate Victorian finery. The E. R. Rogers Mansion in Steilacoom was the topic of Lakewood Historical Society’s May meeting. At 7 p.m. on Tuesday, May 21 at St. Mary’s Episcopal Church at 10630 Gravelly Lake Dr SW in Lakewood, the Society presented ER’s current owner, Peggy Fraychineaud Gross, who provided a virtual tour and spoke about the major facelift to this historic house in Steilacoom’s 40-block historic district. During its 122-year history, the three-story structure has been a private home, a boarding house, a rock museum, and a restaurant. It’s now a Professional Law Office. Being part of a historic community that places high value on historic preservation played a major role in the house’s restoration. 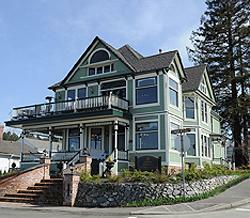 Built in 1891, the massive timber structure that stands at the corner of Wilkes and Commercial Streets in the Town of Steilacoom, has given new meaning to the preservationist term, “adaptive use,” according to Joan Curtis, chair of the Steilacoom’s Historic Preservation and Review Board. The story of this mansion’s transformation into an elegant office is a fitting chapter in the saga of a community that is the oldest incorporated town in Washington State.